Dark Tales: Edgar Allan Poe's Murders in the Rue Morgue is rated 3.6 out of 5 by 42. 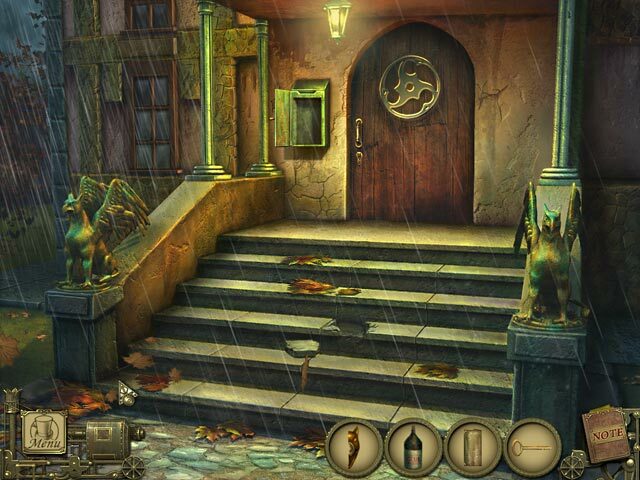 Rated 5 out of 5 by Hollyninelives from A REAL HIDDEN OBJECT GAME! For HOG enthusiasts like myself this game is a dram come true. Basically the story goes along based on how you do with the HOGs and using your gamer instincts. It is a tough run thought with no hints and lots of searching out clues and the tools needed to move on. You deal with one broad scene at a time, dictated by the game itself, and there is some frustration when you first begin. After awhile you'll have your rhythm and that's when your instincts will kick in. Even then it can take time to find what your looking for. I haven't played the CE, but I'm guessing it's just as enjoyable as this edition for us HOG enthusiasts! MY NEW FAVORITE!! 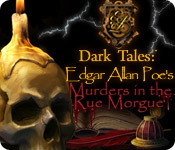 Rated 5 out of 5 by pennmom36 from Dark Tales: Edgar allan Poe's Murders in the Rue Morgue SE Dark Tales are certainly one of the best series of adventure games out there, and Edgar would be proud of the wonderful transformation from novel to game. As with all of the Poe games, this is an adventure where Detective Dupin must solve the who-dun-it crime of murder, and things are never as they seem at first glance. 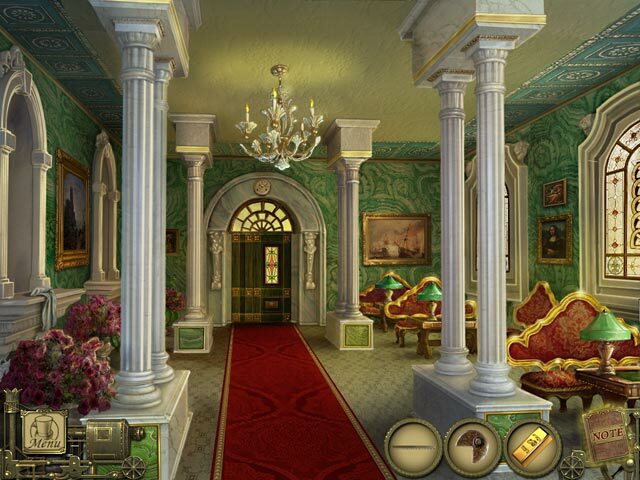 I hope you love Hidden Object Scenes because there are a ton of em, one in every scene, and they are slightly interactive list finds. The mini games are fairly simple, most are entertaining and I haven't come across any that make you want to pull your hair out of frustration. Because this is an older game, there are no voiceovers and no hint button outside of the HOS. There is a map feature that allows you to click and drag the map and choose which locations to search for clues. I recommend the Collectors Edition mostly because of the Strategy Guide feature, but there are also 4 extra scenes in the Bonus chapter, 3 new mini games and 3 new HOS, lock and key puzzles, the original EAP novella, artwork, soundtracks, wallpapers, and a sneak peak at the next game in the series, enjoy! Rated 5 out of 5 by arnold1049 from SHOULD HAVE PURCHASED THE CE This game has a lot of good things going for it. I loved the way the map worked; it takes you to the next area of action automatically. There is very little back and forth and the logical way the story progressed was very gratifying. Because of this, the hint button was only available for the HOS. There were lots of HOS, some of them interconnected so that you had to solve one set before you could finish the next set. They were not extremely hard, but there was usually one or two items that took some looking. The scenes were also interactive, but the item list did not highlight those items that required further action within the scene, so I had to move the cursor around to find these areas. The puzzles were varied and interesting, but not too hard. However, there were no instructions to tell me how to work the puzzle and it wasn't always evident from the puzzle itself. This required me to go to the walkthrough to figure out how to work some of the puzzles. For example, one puzzle consisted of a set of 5 types of tiles in a 5x5 square. I guessed that the object of the puzzle was to place the tiles so that no tile was repeated in any row or column, a common puzzle for this type of layout. When that didn't work, I had to consult the walkthrough, to find out that the object was to make each row or column the same tile so that they were dropped off the grid until the grid was empty. Because this wasn't the CE, going to the walkthrough required me to exit the game every time. If I had gotten the CE, the strategy guide would have been built in. Considering the time it took to exit the game, refer to the walkthrough, then go back to the game, this was pretty frustrating and could have been addressed easily with a few more instructions. I really liked the way the map worked and the lack of going back and forth, big pluses in my opinion. I also liked the fact that the game was a pretty good approximation of the Poe story behind it. I'm sorry I didn't get the CE because of the puzzle frustration, and I am curious what the additional chapter would have covered, but I was still very happy with this game. Rated 5 out of 5 by MAG57 from Dark Tales: Edgar Allan Poe's Mysteries in the Rue Morgue Another excellent game, I enjoy all the Dark Tales games. The only thing that I don't like is that there are some hidden object scenes that are "not fair" and you grow old waiting for the hint button. Rated 5 out of 5 by JustTheFacts from Love At First Sight GAME COMPLETED MANY TIMES Back online after 5 years away, almost my first experience of HOPA style games was the Dark Tales series, and it was love at first sight. 18 months and 300 games later, I still count M. Dupin as the best character in any game I’ve played. But it takes more than my crush on M. Dupin to get five stars from me. Based on Edgar Allan Poe’s story, this game has real appeal to horror and literature fans alike. Told as it is in M. Dupin’s “voice” (not literally, he doesn’t get an actual voice until “Premature Burial”, but I can hear him all the same), we are led through the process of the investigation each step of the way. This means the game is very story driven, with almost no choice of direction, and very little of adventure-like gameplay. Although it doesn’t feel like it, this game is almost exclusively HOS with a few easy puzzles. The HOS, by the way, are amazingly well done for the time this was produced (2009), with beautiful graphics, much more vibrant than the pastels for which ERS are famous now, that can still hold their own against most games. Despite, as I said, Dupin’s control of play movement, he’s not much of a one for hand holding. The HOS are interactive, but there is no indication on the list, you have to figure it out yourself. The items are hard to find not because they are in junk piles but because they are cleverly disguised. Likewise, there is NO, yes I said NO hint at all outside of HO scenes. Puzzles, though simple, come without instructions but, thankfully, with a skip button. It took me 10 minutes of fruitless searching for a code to realise one such game was a simple matching pairs puzzle! Each HOS is visited just the once, but some locations have up to 4 HOS, which sometimes interact between themselves! The journal is a treat in itself, not so much for its usefulness, which is debatable, but for the notes made about M. Dupin and the art of investigation. It all adds up to a delightful atmosphere of the macabre without being at all gruesome. Having finished it I am sure that, like me, you will not want to be without the rest of the Dark Tales series... They get even better from here. Rated 5 out of 5 by centauri272 from Ok, it's short, but I love it! Another ERS game! As usual, the graphics are gorgeous! The storyline is interesting. There are 2 game modes, both of them with sparkles. There is a journal, summary of the story, and a map, but the game is linear: when a location is complete, you won't return. The HOS are clear. The puzzles are very easy. There are only hints in the HOS. The game is short, a bit more than 2 hours. But I didn't mind! Rated 5 out of 5 by Grumpuel from an underrated gem This is an excellent and underrated game, the first of the Dark Tales series based on Edgar Allan Poe short stories. "The Black Cat" has the best gameplay, in my opinion; "The Premature Burial" has the best story. This one, "Murders in the Rue Morgue," is the most rudimentary of the three, but excellent nonetheless. I heartily recommend all three. This adaptation is heavy on HOs and light on puzzles, but the HOs are among the best BigFish has to offer, and the story is classic. Graphics have warm, rich colors, and each scene is wonderful to look at. 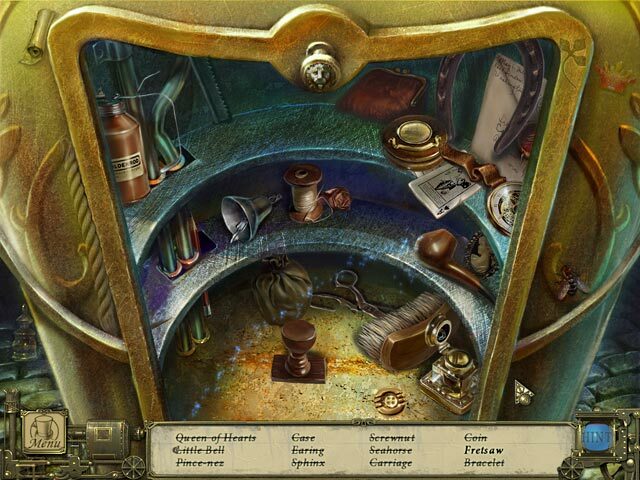 Hidden object puzzles are fair in that nothing is so obscure or small or pallid that a diligent player could not be expected to find it. Some items are large and obvious, more are subtle, and some are devilishly hidden, but as I say, fair. I deliberately chose to rave about the quality of this game in ERS' Dark Tales series precisely because it is slightly less good than the other two and still worthy of a mark of excellence. In fact, it was my admiration for ERS' work that inclined me to give this series a chance, and I am so glad I did that I expect now to buy every ERS game. I have not been disappointed yet. Rated 5 out of 5 by rosekaufmann from Had to Round Up by a 1/4 Star Based on complete SE. Graphics are crisp; music is not intrusive; characters are great. There is a notebook, but you can get the gist of the story from the dialogue, which I found engaging. There are scenes which seem somewhat sinister or spooky, but not too scary. Artwork looked appropriate to the times and was not too dark. Scenes are visited several times. You get a map that comes in quite handy. The characters and dialogue made the storyline better than usual. HOS were relatively easy because the objects were well defined. Plus, they are not the common junk piles; they are merely cluttered. They do require occasional interaction. The randomness of the HOS make the game replayable. Puzzles and mini-games were varied, ranging from assembling an item to spotting differences. [I’m not crazy for the latter, but the developer did add a twist, which I did like.] It was the norm to encounter puzzles whenever a key was needed to open a door. One thing I did not like was closing the popups. I prefer the popup to close when you can either click the close button or "X" or just click outside the popup. You could not close it by just clicking outside of it.